First an april fool’s joke. Now an Android App maps feature. 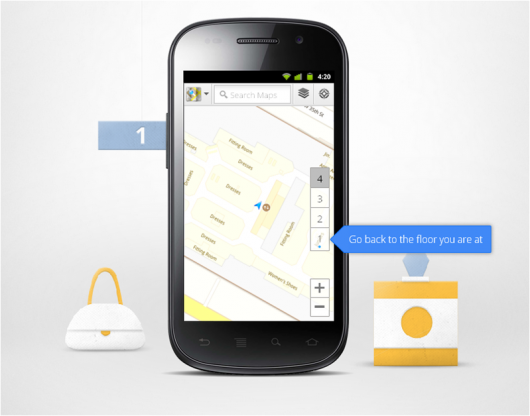 The recently released version 6.0 of the Maps app for Android adds indoors maps. Because GPS is not working properly in closed rooms, this can only work by position determination using triangulation from Wi-Fi hotspots and wireless access points of the location. Practically, this means that the user will then be displayed in relation to their own position, it can even register on what floor you are. Currently the service started with several airports, IKEA-afiliates, and Malls in the U.S. and Japan. Now maps can get even more relevant for businesses, considering the connections with Goole‘s search, G+ and even Google Wallet.